I love watching cooking shows on the Food Network and will often keep the channel on all day. Jon and I also watch some shows together at night. Along with Iron Chef and Alton Brown's Good Eats, his favorites are Guy's Big Bite and Diners, Drive-ins, and Dives with Guy Fieri. I've never made any of Guy's recipes, but saved this one for Garlic Vinegar Chicken a while back. The title of the recipe doesn't sound all that appetizing and I had doubts, but after reading it, I couldn't wait to try it, so last night I did just that. 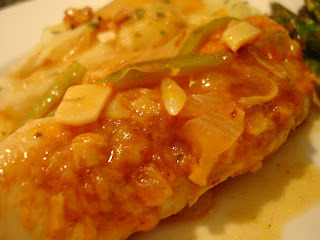 In large saute pan over medium heat add 2 tablespoons oil, onions, chiles and saute for 3 minutes until translucent. Add chicken thighs and lightly brown. Add 1/4 cup garlic and saute. Deglaze with beer and chicken stock. Cook for 3 to 5 minutes, until chicken is 3/4 of the way cooked. Remove chicken from saute pan, and let cool, reserve pan and braising broth. Take cooled, cooked chicken and press paste on to the chicken. Using the pan the garlic was cooked in, heat remaining 2 tablespoons of olive oil in garlic pan, and gently place chicken in the pan. Lightly brown chicken on both sides. In the other pan, simmer reserved braising broth and add red wine vinegar. When chicken is cooked on both sides, pour vinegar broth over chicken and let simmer for 3 to 5 minutes. Garnish with green onions (forgot to do this!). Mmm, my dad is lucky getting these leftovers for lunch today!! I loved this dish. I think I used a little less vinegar than the recipe called for, and that's a good thing. Otherwise I think it would have been to vinegar-y (making up words..). It was sweet and garlicky, and the sauce was a great accent to my roasted potatoes. I would definitely make this again, and I'd recommend it to anyone who loves garlic and is looking for a new chicken dish. I had bookmarked this recipe to try when I saw Guy make it - glad it turned out to be good. I recently made his Coffee Ice Cream Cake - ridiculously easy and perfect way to beat the heat. I love garlic, and I am always looking for new chicken dishes. This one sounds like a keeper!